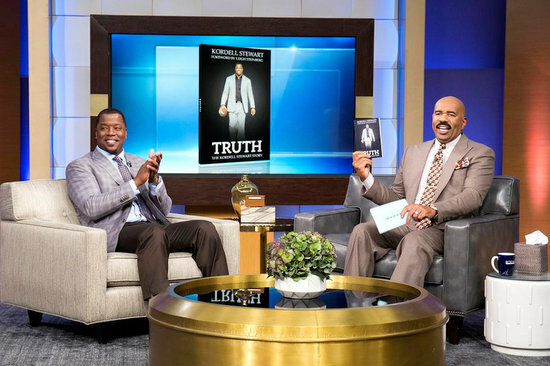 Kordell Stewart has written a new book, Truth: The Kordell Stewart Story, where he opens up about his tumultuous marriage to Porsha Williams, finally confronts controversies about his sexuality, and opens up about what divorcing Porsha has taught him. On The Steve Harvey Show, Kordell reveals that he does not blame Real Housewives Of Atlanta for his marriage failing. Actually, he has “no regrets” about appearing on the show or how he was portrayed. It seems the marriage was doomed from the get-go. Hindsight is 20/20. Kordell dismisses rumors about his sexuality, which where “fueled” by Porsha during their acrimonious split, and he denies that he left her with nothing. The two were married for only about a year. “And that’s why I never felt like I needed to go out and throw mud or shade. If she wanted to talk to help herself, go ahead – enjoy yourself,” Kordell shrugs. Porsha left with a career, and a sure-fire way to get people on her side by speculating about Kordell being gay and a controlling, abusive husband. The marriage dissolving was perhaps a blessing in disguise. Kordell is raising a 13-year-old son, and that’s his priority, not Porsha’s reality TV shenanigans. Well Porsha, you lost a good man but gained a naked empire. TELL US – WHAT DO YOU THINK OF KORDELL’S “TRUTH” ABOUT WHY HIS MARRIAGE TO PORSHA FAILED? You Can Help Pick The Winner Of Kenya Moore’s Moore Manor Contest!